Tonight on The Midnight Tracker, another acquired taste. I’ve long dug keyboards, from the boogie-woogie piano I heard on my dad’s records from the ’40s and ’50s to the Hammond organ on so many great tunes from the ’60s to the fierce yet elegant piano work of Warren Zevon from the ’70s on. This is another album for which I can’t tell you how I came to know about it. Either I read something about it in Rolling Stone or was hepped to it by Mike, the guy who ran the record store in my Wisconsin hometown. “S-Scape” — Influenced by Prokofiev via Woody Allen, and by Pete Townshend and the Who. “Chateau” — A baroque, almost classical piece. One of the few pieces Fast put together on a piano rather than an electronic instrument. “Cybersports” — Imagine a soundtrack for the earliest video games, like Pong. 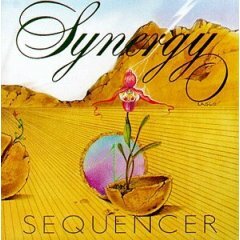 “S-Scape,” “Chateau,” “Cybersports” and “Classical Gas,” Synergy, from “Sequencer,” 1976. It runs 17:25. Tonight’s side was unearthed during our last visit to the New Frontier Record Exchange in Appleton, Wisconsin a trip we discussed the other day over at our other blog — AM, Then FM. 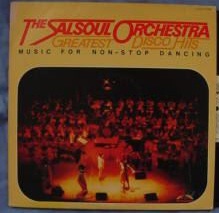 “The Salsoul Orchestra: Greatest Disco Hits,” a 1978 compilation album. 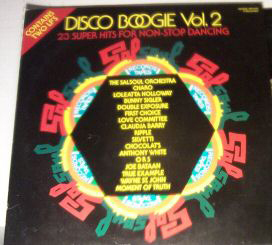 “Disco Boogie Vol. 2″ is a two-record set, but this was only one of the records, with no jacket. “Just take it,” the guy at the record store said. So I did, and it’s not too bad. It’s mixed together as one long cut for a better experience on the dance floor. You could do worse for a party mix. 1. “Where Will It End,” Love Committee (mixed by Walter Gibbons). Easily the best cut. More straight mid-’70s Philly soul than a dance number. 2. “Dance A Little Bit Closer,” Charo and the Salsoul Orchestra. On first listen, I thought this wasn’t too bad. On subsequent listens, yes, it is. 3. “Primitive Man,” Silvetti (mixed by Tom Moulton). A couple of nice bass lines on this one, especially one that percolates relentlessly. 4. “Something’s Up (Love Me Like the First Time),” Wayne St. John. Some nice wah-wah guitar on this one. 5. “Love Is Finally Coming My Way,” True Example (mixed by Walter Gibbons). Upbeat and light, yet with a couple of strong, soulful male and female lead singers. 6. “Johnny, Johnny, Please Come Home,” Claudja Barry (mixed by Tom Moulton). You’d think this was a ’60s girl-group song if not for its driving dance orchestration. Not for all tastes, but there are worse ways to spend 22 minutes, 29 seconds. Every month or so, I drop by my friendly neighborhood used record store. There’s a $1 bin in which there are some treasures to be found. There also are other bins, in which more collectible, more desirable albums can be found for a still-reasonable price. When I was there the other day, I came across “Fire and Water,” the classic 1970 album from Free, in the other bins. My only problem — and this may come only when you reach the point that you have too many albums — was this: I knew I’d never bought it, but I couldn’t recall whether it was one of my wife’s albums. So, after a bit of indecision, I figured if it was a double, $4 wasn’t too much to pay for it. Happily, it wasn’t a double. Now we have a nice, clean copy. Well worth the $4. This was about as good as mainstream rock got at the time. Free consisted of Paul Rodgers on vocals, Paul Kossoff on guitar, Andy Fraser on bass and Simon Kirke on drums. Of the cuts on this side, “Mr. Big” offers some classic ’70s jamming by all; “Don’t Say You Love Me” has a slow, mellow groove and Rodgers’ pleading vocals; and “All Right Now” … well, I trust you know that one. 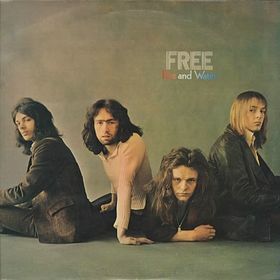 When this album was released in June 1970, Free had been together for two years, making a name for itself in England as a blues-rock band. “Fire and Water” is more rock than blues. Not much blues at all, really. Even though Free had been together for two years at the time, its members still were what now seems impossibly young. Rodgers, the guy behind that world-weary voice, was 20. Kirke also was 20. Kossoff, just 19, already was a skilled blues guitarist. Fraser, who with Rodgers co-wrote five of the seven cuts on this album, was just 17. This was as good as it got for Free. They broke up 10 months after “Fire and Water” came out, stayed apart for about a year, then got back together for one final year. They called it quits for good in 1973. Kossoff’s drug problems contributed to the instability, and he died in 1976, just 25. Though you know “All Right Now” all too well, I’ve ripped that side so you can listen to it in the context of the rest of Free’s work at that time. “Mr. Big,” “Don’t Say You Love Me” and “All Right Now,” Free, from “Fire and Water,” 1970. It runs 17:10.